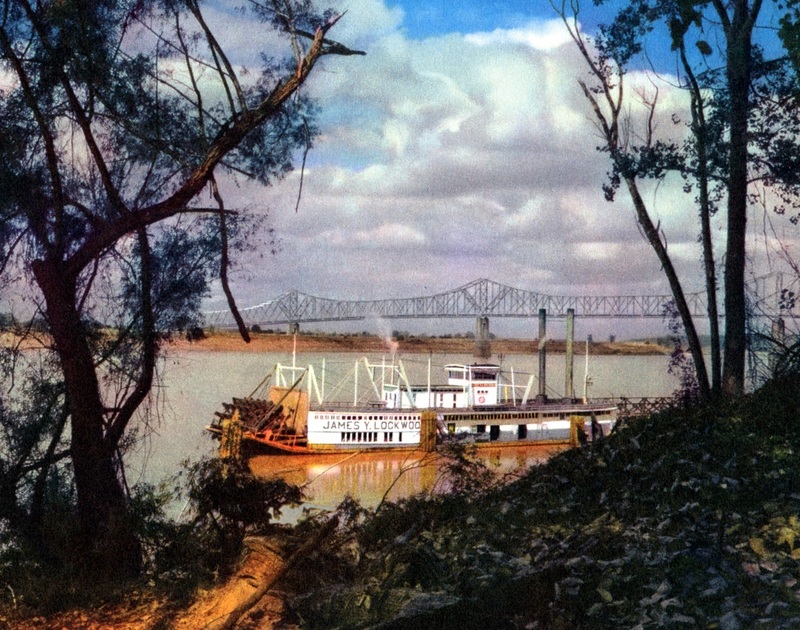 Towboat JAMES Y. LOCKWOOD in a scenic color photo from a 1949 calendar sponsored by De Laval, a company that manufactures dairy equipment. 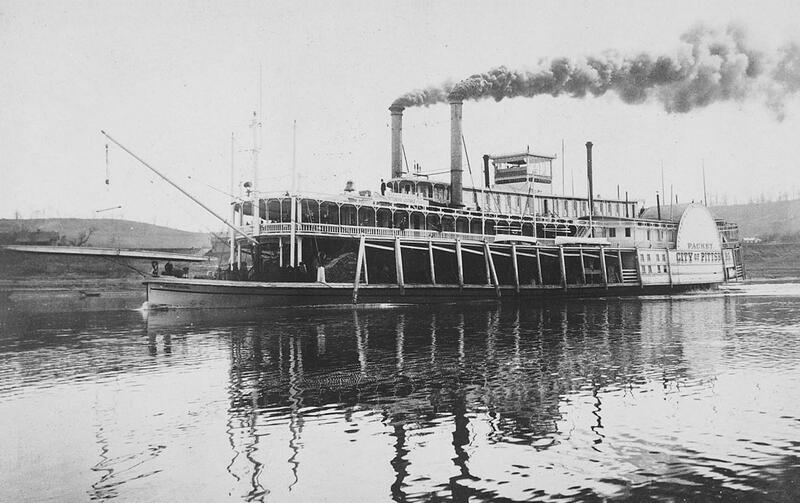 The JAMES Y. LOCKWOOD, a sternwheel towboat built in 1896, towed a railroad transfer barge for many years at St. Louis (Ivory Street) for the M-P railroad. 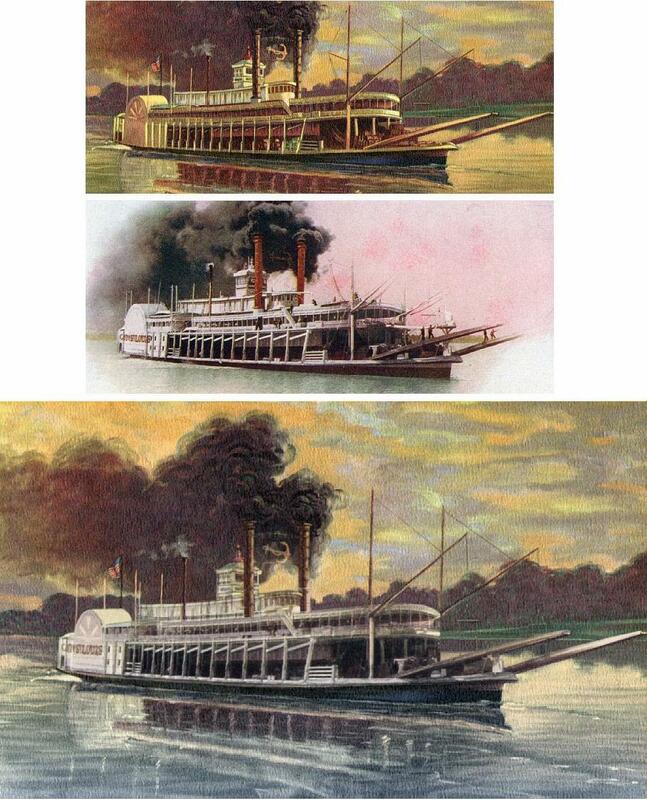 In 1927 this vessel began towing a transfer barge for the Natchez & Southern Railway at Natchez. The LOCKWOOD was retired from active service in 1961 and Joseph H. Salon of Chicago bought it from the Missouri Pacific Railroad and the boat traveled to Chicago under its own steam. The restaurant was docked in the Chicago River off Ontario Street near Salon's trucking company at 600 North Kingsbury Street. In 1970 the SARI-S was taken to Buffalo, N.Y. where she again served as a restaurant. In 1989 she was transported to the Netherlands and renamed MARK TWAIN. Detail of a 1943 calendar for J.R. Watkins liniment (that is still being made and sold today). 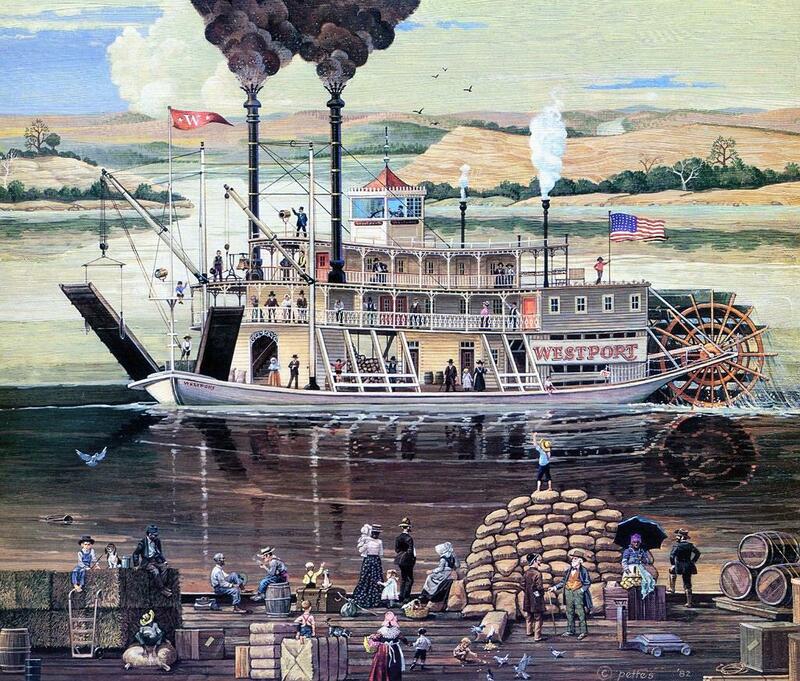 Winona, Minnesota on the Mississippi River is the headquarters of the Watkins company. I've been to Winona several times and there are indeed beautiful bluffs there along the river just as seen in the distance in the painting. 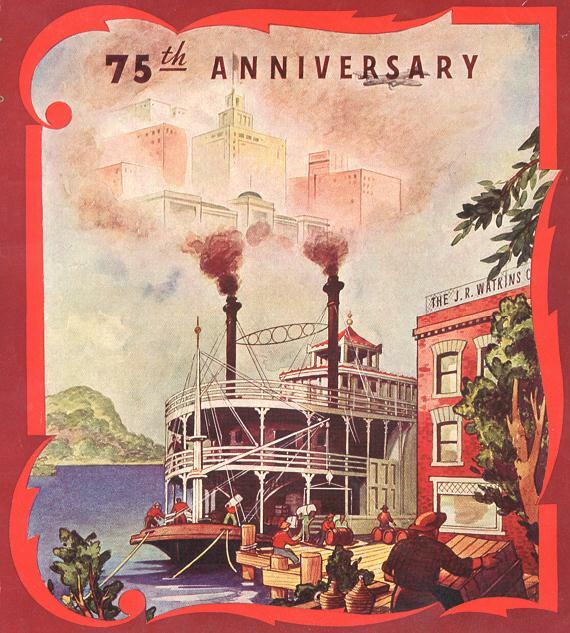 The "modern city" inside the smoke from the steamboats stacks in the graphic must be a reminder of how the liniment was still as beneficial in 1943 as it was in 1868 when it was first introduced to folks who needed relief from their aches and pains. Calendar art, looks like circa late 40's, early '50's. 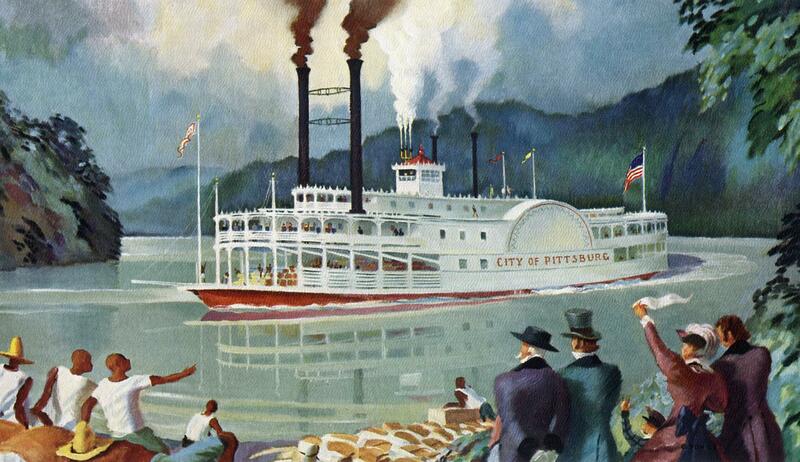 It was captioned "Steamboat Round the Bend," size 6 X 10 1/4 inches. Ohio River setting apparently judging from the distant hills. Nice painting technique, the artist was a practiced hand at controlling the medium. If compare to the photo of the City of Pittsburg (Neg. 10325, see below) at the Murphy site you will see see the many liberties the painter took while idealizing & romanticizing the boat, altering its style and many details. C of P had a brief life span, only 4 years. 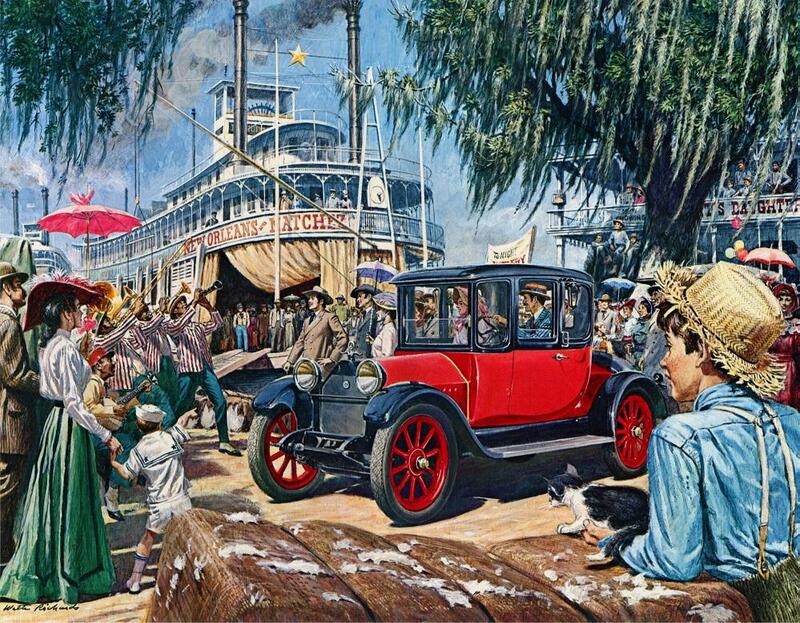 Strolling band, entertainers, pretty girls—something for everyone when the showboat, belching smoke and promising gaiety, eased into the Mississippi River shore and lowered the gangplank.This would be a day to be enjoyed and long remembered. As electric lighting and starting, and left hand controls came into general use, automobiles were easier and safer to drive at night and in bad weather. Closed cars like this powerful Chalmers Coupe became increasingly popular. NEW HORIZONS calendar art - 1949. 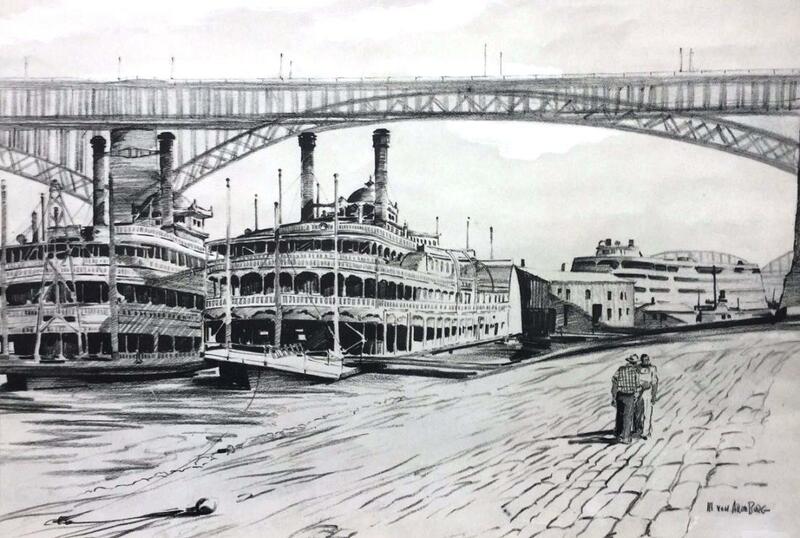 When I was bidding on a piece of calendar art on eBay I recognized the boat right away as having been based on a photo of the CITY OF ST. LOUIS. I double exposed that art with a postcard of the C of SL and managed to improve the color scheme and detailing on the calendar graphic; the name on the paddlebox came through nicely and the stacks look better as well. Feels a little more like Dean Cornwell* might have done it although he'd have painted a better riverscape . . . I'll have to see if I can improve on that also. Will send an uncropped version of the composite as well. Then the green/brackish lookin' water was gettin' to me so I subdued the palette. You convert the whole image to grayscale, tint it blue green then double expose it over your color version. Detail from "Mississippi Paddlers" - St. Louis, Missouri by Mark Von Arenburg From an Eastern Airlines Calendar for 1945. This artwork was for the month of August. Mixed medium of charcoal pencil and watercolor. 9.80 x 12.50 inches. Eads Bridge middle ground, 2 Streckfus excursion boats on the left and the ADMIRAL (looking like an upside down stainless steel bathtub in the distance on the right). The other 11 months were also devoted to various locales in the U.S.A. Von Arenburg was best known for spectacularly romanticized paintings in vivid colors featured on travel posters for Pan American World Airways from the late 1930's and into the early 1950's. 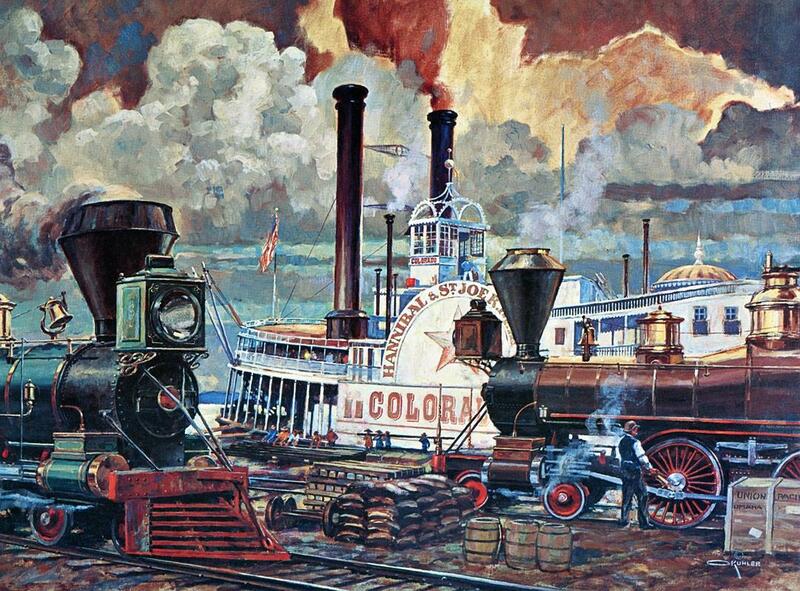 Nice painting, perhaps commissioned as calendar art by Otto Kuhler of the Hannibal & St. Jo RR's COLORADO with a pair of locomotives in the foreground. This probably represented the banks of the Missouri River at St. Joseph, Missouri circa late 1860's, early 1870's. Although best known for his industrial designs, Otto Kuhler (1894-1977) is well regarded as a fine artist and draftsman. Born in Germany, Kuhler was the sole heir to his family's successful steel business, Kuhler Forges. After WWI however, the business and his family's fortune were in ruins. After living briefly in Dusseldorf, and partly due to the advice of friend Joseph Pennell, he took up etching and emigrated to the States in 1923. Otto Kuhler's etchings of begrimed industry sprang from the same optimistic response to technology that led to his colorful streamlined designs for the Milwaukee, Lehigh and other railroads in the 1930's. His prints bridge art and industry&freely-sketched scenes that celebrate precise engineering and industrial might. This merging of industry and art proved so successful that after years of submitting designs, a locomotive based on Kuhler's designs was built. The engine, Hiawatha, rolled out of the Schenectady, New York yard in May, 1935. It was the first streamlined steam locomotive to be built from scratch in America. This signaled the start of the next phase of his career—as a successful industrial designer. 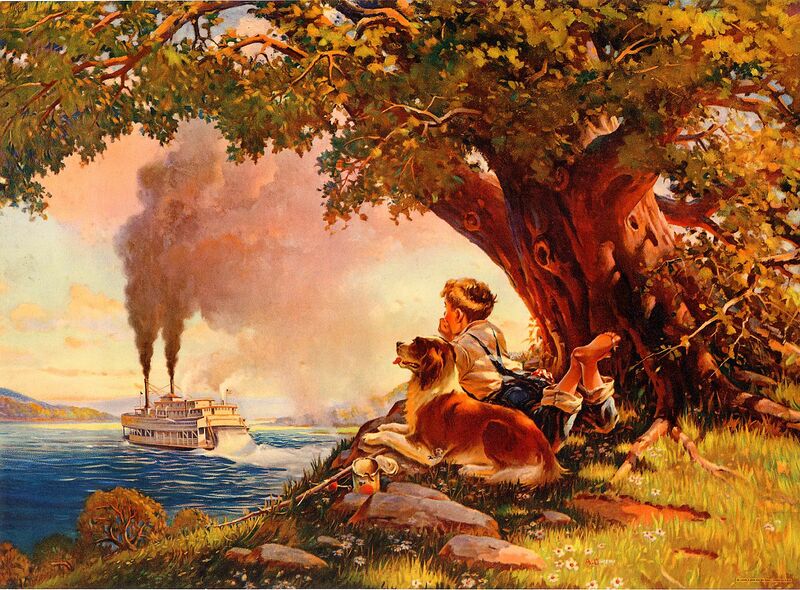 One of Bob Pettes' "Nostalgic Impressions" of a fictional steamboat he named WESTPORT painted in 1982. Westport, Missouri was a town on the Missouri River that was annexed by Kansas City, Missouri in 1897. Pettes moved to Kansas City later in life and may have lived in the Westport district or liked the historicsignificance of the name. 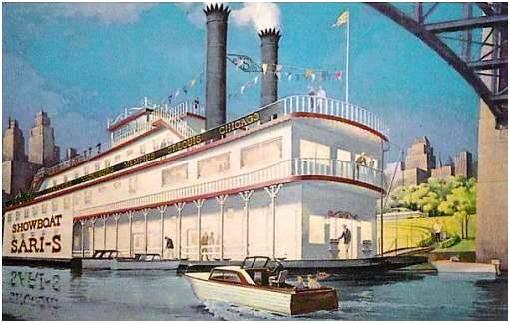 Fred Way does not list a steamboat named WESTPORT but there may very wellhave been one early on when Missouri River steamboats were plentiful. This 9.05 X 10.75 inch print was from a 1991 calendar. Bob brought lots of charm and precision in his style. The overall wood grain texture in the background enhances the nostalgic flavor of the piece. Abridged obituary on Bob Pettes from the Kansas City Star below. Our loving husband, father, friend and neighbor, Robert Pettes died Feb. 27, 2015. We will miss his smiles and humor and his kind and uplifting words. Born in Minneapolis, Minn., on May 16, 1922, it was soon evident that his talent was art. Starting out in a print shop he could get to on his bicycle, he delivered stats to customers in the area. He had his own studio in downtown Minneapolis, then went in with a couple of other artists. They did illustrations for General Mills and 3M, as the word got out about their talents. The war came and he enlisted in the Coast Guard and served as ship's cook on the USS Serpens after he was sent to cook and bakers school in New York. He also assumed the role of chaplain with the permission of his captain. After the war he worked for Brown & Bigelow in Minneapolis, traveled to Europe, and used some of his observations to build a French house for sale and later an English house. He later moved to Kansas City went to work for Hallmark cards where he met his wife, Gwen. They were married in 1976. He began painting in his home studio in Prairie Village in a style he called Nostalgic Impressions, using his memories from childhood visits to southern Minnesota. In later years his style included scenes and landscapes from trips to Europe with Gwen. Color photo of the GORDON C. GREENE on the Tennessee River provided by the Tennessee Dept. 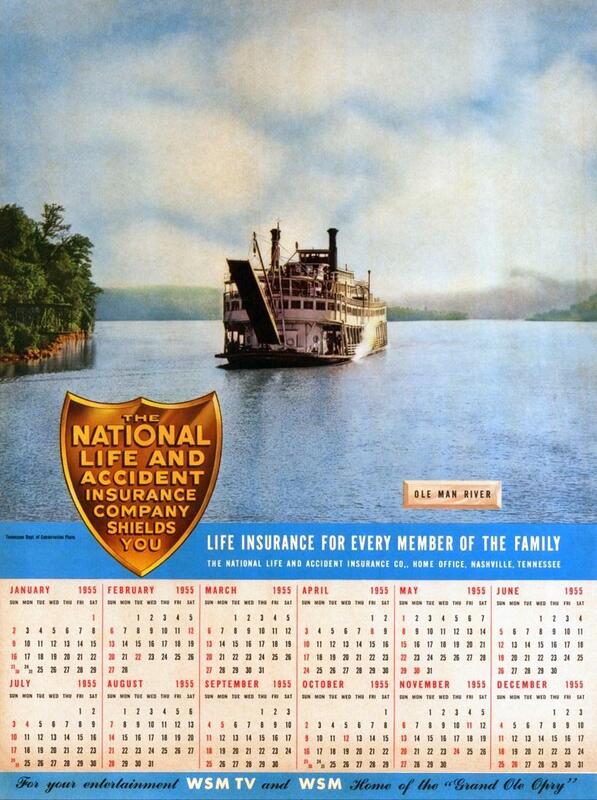 of Conservation featured on this 1955 OLE MAN RIVER themed calendar issued by the National Life Insurance of Nashville, Tennessee. 10 1/4 x 13 3/4 inches. "For your entertainment WSM TV and WSM Home of the 'Grand Ole Opry'." This calendar would have been given to subscribers by National Life and perhaps advertised on the Opry as a free offer to listeners who wrote in to WSM to request one of these as a complimentary promotional item. Find more about the Gordon C. Green - click here.